4.1 out of 5 based on 108 bloggers and 9 commenters. 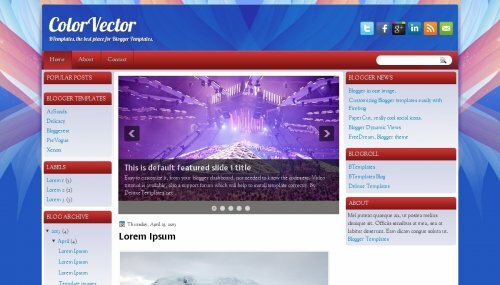 ColorVector is a free blogger template with 2 columns, left and right sidebars, fresh look, rounded corners, slider, social bookmarking icons, abstract, floral motifs and 3D effect. Leading Event Organizer For Wedding Corporate Parties Delhi. Contact! Awesome Template. Going to Use it. Thnx for Uploading. 2 columns. Bothes are intiligent & beauty. social bookmarking icons are great of them in my mind.